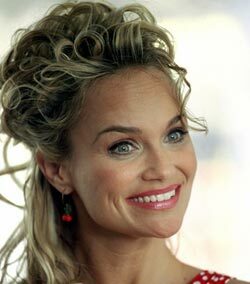 Chenoweth was born in Broken Arrow, Oklahoma. She graduated from Oklahoma City University, where she received a bachelor's degree in musical theater and a master's degree in opera performance. She performed at Opryland. She won a "most talented up-and-coming singer" award in the Metropolitan Opera National Council auditions, which came with a full scholarship to Philadelphia's Academy of Vocal Arts; she turned down the scholarship when she auditioned and won a part on an Off-Broadway show. Chenoweth made her Broadway debut in a production of Moliere's Scapin starring Bill Irwin, followed in the spring of 1997 by the unsuccessful John Kander and Fred Ebb musical Steel Pier, for which she won a Theatre World award. The following season, she appeared in the City Center Encores! production of the George Gershwin and Ira Gershwin musical Strike Up the Band, and the Lincoln Center Theater production of William Finn's A New Brain. During the 1998 - 1999 season, she created the role of Sally in the Broadway revival of You're a Good Man, Charlie Brown, sweeping the Tony, Drama Desk and Outer Critics Circle Awards as the season's "Best Featured Actress in a Musical." Next, she starred in the Broadway comedy Epic Proportions, followed by appearances in ABC's television adaptation of the musical Annie (as Lily St. Regis), and in the leading role of Daisy Gamble in the City Center Encores! production of On a Clear Day You Can See Forever. Chenoweth was a part of ABC's An American Celebration at Ford's Theater with Kelsey Grammer, NBC's Salute to the Olympic Winners, The Kennedy Center Gala honoring Julie Andrews and an episode of Frasier on NBC. She also starred as Marian the librarian in the ABC television production of Meredith Willson's The Music Man opposite Matthew Broderick. In October 2003, Chenoweth returned to Broadway in Wicked, a musical about the early years of the witches of Oz, and was nominated for a Tony as Best Leading Actress in a Musical for her performance as Glinda, but lost to co-star Idina Menzel. Chenoweth has also performed leading roles at the Goodspeed Opera House and the Guthrie Theatre, and she was chosen by the late Jerome Robbins as the guest soloist in his West Side Story Suite of Dances at New York City Ballet. She also starred in a short-lived sitcom, Kristin, for NBC. It was a mid-season replacement in 2001 that co-starred Jon Tenney, but was cancelled after only six episodes. Throughout the sixth season (2004 - 2005) of The West Wing, Chenoweth has had a recurring role playing media consultant Annabeth Schott, which is going to continue into the show's seventh season. She is scheduled to appear in the movie Asphalt Beach in 2005. Her latest album As I Am was released in April 2005; the album is a mixture of hymns and contemporary Christian music, with arrangements that sound more like adult contemporary and country music.